I had a hankering for some oatmeal cookies, and as of Sunday, we had not done any of our annual holiday baking. The only solution was to make a batch. I decided to flavor them with dried cranberries and grated orange zest, since I had both on hand, but whose master recipe to use? We had an egg shortage, so I found a recipe that called for only one egg, this adaptation of Nick Malgieri's cookie recipe. It also required only a wee smidge of butter, plus the addition of applesauce. I didn't have the latter, so substituted apple butter. The verdict? Too oddly toffee-like, not nearly sweet enough, and not buttery enough either. They taste ok, but the texture is not what I wanted. 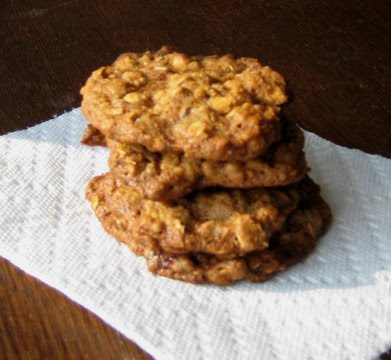 I'll have to try a different recipe next time...any suggestions for good chewy oatmeal cookies?